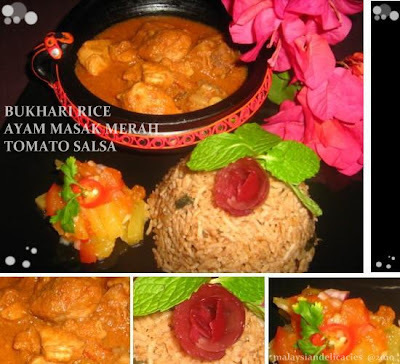 As I was browsing thru the many blogs ,I came across Sanyukta?s Cooking with Tomatoes Event.The event caught my attention and was wondering what Malaysian delicacy that I can come up with using tomatoes.The one dish that keep coming to my mind was Ayam Masak Merah or Red Chicken Curry.Translated the dish is known as Chicken cooked in red sauce.Ayam Masak Merah is a famous malay wedding dish .You can come across this dish widely in many functions.The original recipe is chicken marinated with turmeric and salt. It is then deep fried.A sauce or gravy is done to coat the chicken.The gravy comprises of dried chillies,tomato sauce,tomato puree ,a mild use of ginger garlic paste,and a generous amount of sliced onions. The dish is dried and has a fiery red colouring in presentation. One can but not appreciate this beautiful and tasty dish which goes along well with nasi kunyit or beriani.My recipe today actually differs slightly from its original recipe.As I have come across tasting this Ayam Masak Merah which has a rich coconut milk gravy to it. I will of course share the original recipe another time, but for now I hope you enjoy and try out this beautiful recipe as well.I have tasted the dish but do not know the actually ingredients.So it is to my discretion that this recipe has been created and frankly I am happy of the result because it actually tastes the same as to the one I had in mind. To go along with this dish, I made Nasi Bukhari and tomato salsa. Nasi Bukhari is Arabic in origin and it is essentially a variation of pilaf.I manage to get a packet of the ready made Faiza Bukhari spice .The spices are a combination of nutmeg,fennel, cumin seeds, cloves,cinnamon,cardamom, coriander ,shajeera, anise and black pepper.So the rice recipe is also included in today?s blogging. 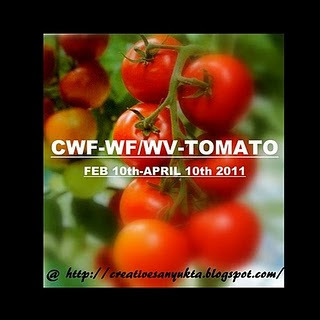 A side dish of tomato salsa finishes up this one set menu.You can also have a stir fry and some fried papad to make it a full menu .All three recipes uses tomatoes.So just great to submit to CWF-WF/WV-Tomato!! Tomato is such a versatile fruit.It is widely used in many dishes across the world.Known as the apple of love by the French,tomatoes help to stimulate blood circulation with its high level s of vitamin C.The Aztecs and other peoples in the region used the fruit in their cooking while the southern Mexican started to cultivate it probably by 500BC. Aztec writings have mentioned tomatoes were prepared with peppers, corn and salt .Therefore its no wonder of the variation tomatoes have brought to food thru its existence through out the centuries. What with its appearance ?red and luscious ,it is considered a passion inducing sensual food. Soak briyani rice in water for 20mins.Drain in a colander. Heat 1tbsp ghee, add in cinnamon stick, and sauté the grind ingredients until aromatic.Mix in the Bukhari spice and stir for a few seconds.Add in drained briyani rice and give a few stir.Let teh rice mix well with the spices. Transfer the mixture to the rice cooker.Mix in evaporated milk.Place teh lemongrass and screwpine leaves.Pour in the water and add salt.Give a stir. Cook until rice is done. Before serving,discard the screwpine leaves and lemon grass. Heat 4 tbsp oil, add in chopped tomatoes and cook until it come to a very soft paste ,add in the grind ingredients and sauté further until the spices are aromatic. Mix in tomato puree and stir further.In between add in chicken pieces, lemon grass,tomato sauce and salt.Mix well so that the chicken is well incorporated with the spices.Leave to cook for about 2 mins. Reduce the heat and pour in light coconut milk,stir and leave to simmer very gently. Finalize by adding the thick coconut milk and once it bubbles a few times,close fire.Taste and adjust seasoning.Best serve with briyani, Nasi Kunyit,White rice or even with bread. Halve the tomatoes.Discard the pith. Place the tomatoes and pineapples in a flat tray.Sprinkle with some sugar and coarse chilli flakes. Bake in preheated oven 200C for 15mins. Peel of the skin from the tomatoes.Cut small .Cut the pineapple in required size. In a bowl, combine apples, pineapples and tomatoes.Mix in mustard ,chilli sauce and calamansi juice.Give a stir.Keep refrigerated.